Tributes on-air and online are pouring in for the two Virginia journalists who were shot and killed during a live broadcast. Heartbroken over the loss of two members of our @WDBJ7Mornin family...There are simply no words. "They were special people," WBDJ7 anchor Kimberly McBroom, said on air. "They would brighten up the room every morning." President Barack Obama said "it breaks my heart every time" he reads or hears about these kinds of incidents. "What we know is that the number of people who die from gun-related incidents around this country dwarfs any deaths that happen through terrorism," he said. Alison Parker, who just turned 24, an on-air reporter for the Virginia-based news station, and Adam Ward, 27, a photographer for over four years with the team, were gunned down during a live interview just before 7 a.m. on Wednesday at a shopping center in Moneta, Virginia. 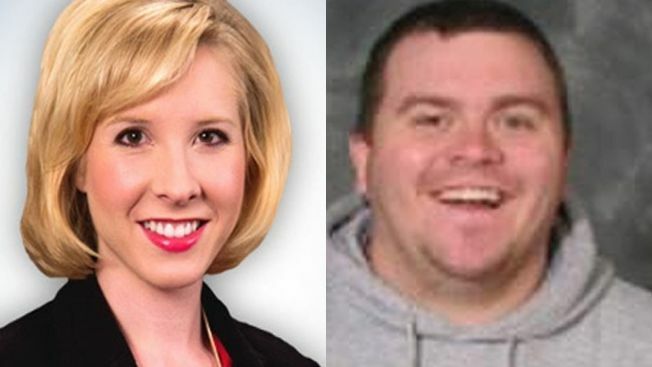 Both Parker and Ward were involved in romantic relationships with other people at WDBJ7, according to Mike Morgan, who works in the station's promotions department, NBC News reported. Both journalists were from around the area. "We didn't share this publicly, but Alison Parker and I were very much in love," evening news anchor, Chris Hurst, posted on Facebook and Twitter. "We just moved in together. I am numb." According to Hurst's Facebook posts, he and Parker had started dating only nine months ago and planned on getting married. Hurst also posted several photos of the couple together. Ward was engaged to the show's morning producer Melissa Ott, who witnessed the horrific scene. Melissa Gaona, an anchor with the news team, remembered Ward as being a "godly man." "We used to pray sometimes in our live truck before the show," Gaona wrote in a Facebook caption accompanying a picture of her and Ward. In memory of Alison Parker, WDBJ7 posted a video "Fun Facts about Mornin' reporter Alison Parker." Parker enjoyed whitewater kayaking, playing with her parents' dog Jack and attending community theater events, according to her bio on WBDJ's website.